How is an elastic Interface® pad made and which processes does it undergo before becoming a finished product? First of all we should say that the initial steps are the same in both types of chamois, i.e. sown or thermoformed, of which we will later analyse the single peculiarities. The first step is the creation of a graphic sketch based on the client’s input (in the case of customized articles) or that of our R&D department, and is followed by the re-elaboration of the data obtained by the technical department using a 3D graphics program. In the case of customized chamois, we provide the client with the final design, focusing on the creation of a first prototype only after the client’s approval; for the serially-produced items instead, we directly make a test model. At this point we focus on the selection and control of the materials and the fabric, monitoring in detail every aspect of the production. When this first phase is completed, after obtaining the semi-finished foam and fabric products, we begin the assembly process. Stitching the chamois: how is it done? Stitching the chamois requires meticulous precision and machinery of the highest quality customized for this purpose. After branding the logo, we assemble the padding with the upper part of the chamois by programming the computerised sewing. The threads we use are highly resistant to wear and tear, and at the same time guarantee the product’s elasticity and softness to the touch. For particular anatomical chamoises, we use ultrasound stitching in place of the classic needle and thread stitches. This technique helps to reduce the thickness of the seams making them invisible and is, firstly, a solution aimed at improving the comfort of specific products with an innovative design. These types of articles are often combined with a heat welding process, thanks to which the stitches that are subjected to greater friction are further fused. The production of a thermoformed chamois is just as delicate an operation, that begins with the assembly of the padding and fabric previously cut using the laser-moulded jigs; thanks to the jigs the foams remain perfectly in place in the first phase of the assembly. The shape of the chamois is instead obtained through a thermoforming process in which a heat press with double mould shapes the chamois as previously designed based on the final use of the product. When these production phases are completed, the chamois undergoes an accurate quality control check in conformity with the ISO 9001 regulations, in which an operator verifies the measurements, thickness, seams and aesthetic aspect. Do you wish to emulate your favourite champions? It will be tough to reach their achievements, but always remember that we can all wear top of the range products, starting from the chamois. 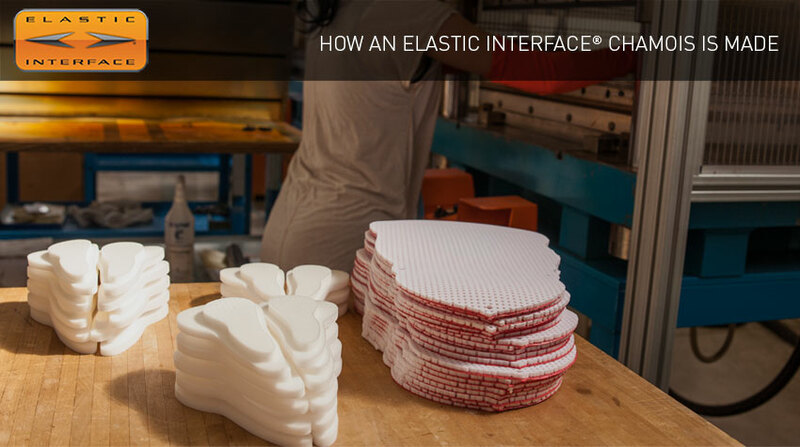 For further information, we recommend you watch our video on the making of an Elastic Interface® chamois. Enjoy!